ShoutBloger: If there is a sentence "Your Computer Appears to be infected", stop at your computer screen while doing a search on the Google search engine, do not be surprised. As quoted from the site InformationWeek, recently Google was going to give notification when the encounter a computer that is ridden by malicious software (malicious software/malware) when searching the Internet. Over the last few years, Google has always alerted the user when the results of its search engine Google index leads to a page containing harmful malware. 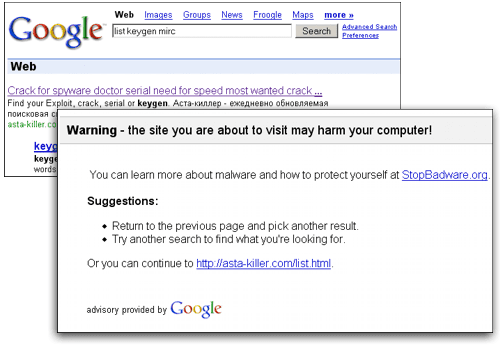 Now, for the first time Google will warn users when the computer has been infected with malware is detected. This step is taken after a Google search found a lot of unusual traffic on its search engine, while performing routine maintenance on its data center. After collaborating with a variety of security experts from various companies, we concluded that the computers that show unusual behavior that has been contracted by a specific type of malicious software, said Damian Menscher, Google security engineer. Typically, the computer has been infected, it will send traffic to Google through proxy servers. According to Google, millions of computers have been infected by this malware. Google itself has warned hundreds of thousands of people who have been infected. The source of this malware infection is suspected one of hundreds of types of fake antivirus software. Because, now many malicious software that pretends to be an antivirus program with the goal of keeping the unsuspecting Internet users to install malware onto their computers. However, Google claimed not to know the specific name of fake antivirus programs that have responsibility in this regard. 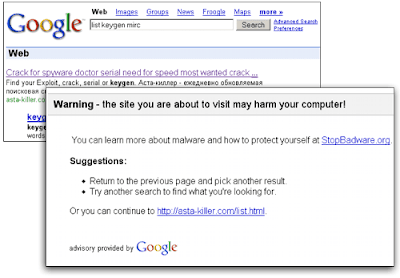 Therefore, Google advises Internet users to use antivirus software that has been proven to scan their computers from this malicious program infection. In addition, Google warned that Internet users be careful when they want to install an antivirus software, antivirus software and ensure that it is not fake.